Brides of all ages, from hundreds of different countries with thousands of different traditions have tended to have one thing in common. It has often been customary for the bride to carry a flowers as a bouquet, or to have flowers or plants woven into her hair or gown. Sometimes for beauty, to bring good fortune or, at marriage ceremonies long ago, to ward off evil spirits. 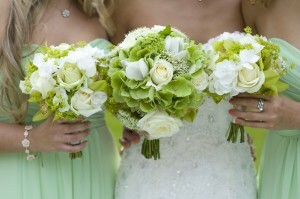 In ancient times, the bridal arrangements may have been heavier on the herbal than the floral. Garlic, sage and other medicinal plants were especially prized for their ability to ward off evil spirits. Some civilizations ensured that orange blossoms were incorporated into floral arrangements to symbolize fertility. While in others, women would walk down the aisle with sheaves of wheat in her arms. This was believed to bring her, her husband and their future family good crops and prosperity. Nowadays, most women are more concerned with coordinating their bouquets to match their magnificent dresses and banquet arrangements. Garlic may be permissible on the buffet, but it would most certainly spoil the scent of a girl’s favourite perfume! Syle and beauty are far more important considerations when it comes to bridal bouquets than symbolism and magical properties. But that’s not always been the case when it comes to flowers, floral arrangements and their place in a wedding ceremony. It is believed that the first bouquets were arranged in Ancient Egypt as far back as 2500 BC. Herbs, flowers and grasses went into these displays. Sacred plants, flowers and herbs were also placed in bowls and as wreaths. Often a wreaths would be placed around the neck of a house guest. This tradition continues in Hawaii, with the giving of “lei” to show affection and welcome visitors. It is a popular custom throughout the Pacific islands and possibly originated in likely originated in Polynesia. It is also common in Thailand and some other South-east Asian countries to present guests with a necklace of flowers and they are also used to decorate figures at Buddhist shrines. 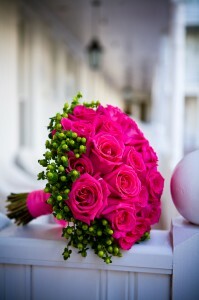 India too, has a long history of gifting floral arrangements as a show of friendship and hospitality. 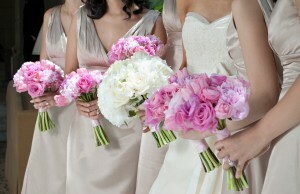 The first bridal bouquets women carried down the aisle were simple affairs. Pretty, but intended more as a symbol of fertility than a fashionable and expensive wedding accessory. In Ancient Rome, brides would have herbs or flowers woven into their hair instead. Women in Ancient Greece often incorporated ivy into their wedding accessories at marriage ceremonies. Long a symbol of everlasting love., it was believed to ensure the newly-wed couple would enjoy a lengthy and loving marriage. Ivy is still commonly used to decorate bouquets and banquet halls at Greek wedding celebrations today. The Dutch are believed to be the first to experiment with ornate flower arrangements. Many famous Dutch painters used were inspired by the colours and textures of the floral displays and many famous paintings resulted. By the Victorian era, different flowers and their colours represented different emotions and sent a message to the person whom received them. It was essential to speak “The Language of Flowers” as it was called, when sending flowers or incorporating them into marriage celebrations. 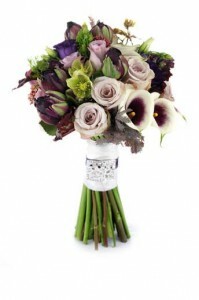 Ladies who like roses and lilies often opt to bear this style of bouquet as they take their walk down the aisle. Tight and compact arrangements that have been a favourite of brides since medieval times. This style of arrangement is full of flowers at the top. But the beauty doesn’t end there. The trail of flowers, vines and tendrils continue to “cascade” downwards. One of the most classic of classic cascades would be the bouquet chosen by Lady Diane for her wedding to Prince Charles. Only the best blossoms are chosen and then arranged into a wrist-mounted bouquet. It is elegant and reminiscent of the classic choices our mothers and grandmothers may have made. 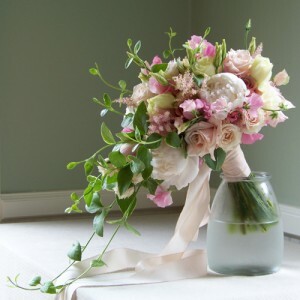 Hand tied bouquets have become popular in recent years, possibly reflecting some brides preferences for admiring and exhibiting flowers in a more natural state. Not fussy, or over-organized, these arrangements make room for blossoms, buds, stems and all. If you can dream it, you’ll be able to find a florist who’ll build it. Contemporary or classic, nothing is out of bounds. The bridal bouquet should be (almost) as beautiful as the bride, and every bit as unique. Japan is one of many countries where marriage ceremonies are emulating those we have in the west. Some young Japanese couples still choose to have only one traditional Buddhist wedding ceremony. In this situation a bride does not carry a bouquet. Increasingly however, brides and grooms are choosing to arrange a Western-style wedding. Some even opt to celebrate twice and have one of each! This the ancient art of flower arranging that came from China to Japan many years ago. 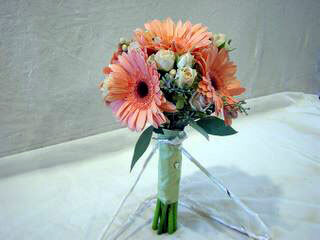 To a non-Japanese, such bridal bouquets may seem simple. But to the refined eye they are works of art. Also, Buddhism believes that all of life, including plants and flowers, is sacred. Hence ikebana practitioners often tried to create as much beauty as possible with as few cut flowers as possible. The practice of the bride throwing the bouquet may have come from a somewhat similar ritual in Ancient Greece. When the bride arrived at her new home following the marriage ceremony, she would light the lanterns at her new home with a torch. The flame would be extinguished and she would toss the torch over her shoulder. The first to catch it would receive the good luck she carried on her wedding day. The French apparently added the modern twist to this aged tradition. New brides now carried bouquets not burned out torches, Willingness to spread their good fortune, the new bride would toss the bouquet at the end of the wedding ceremony. It was (and still often is!) 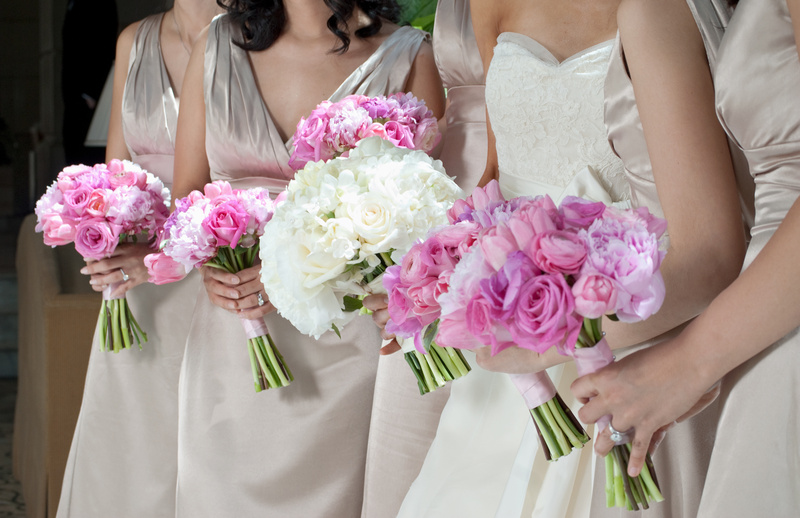 believed that the lucky lady who catches the bride’s bouquet may be the next in line for a wedding! Looking to Send Flowers to Rockingham for a Wedding Reception or Party?